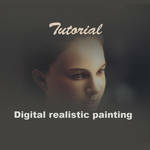 Digital painting tips for beginners. I'm not the best person to give advice about art, once I do not consider myself an artist (yes, it's true lol). But I've always been very curious and interested with the theme "digital painting", and I spent (and still spend) hours and hours watching videos 2 hours long on Youtube lol livestreams, etc.. I think I'm the only person who has the patience for it, hahahaha, but it was what helped me to evolve and learn all the techniques I know now to perform my work. I asked the help of many artists that I admire, and some even helped me, but most of them do not care how much you want to learn. Thinking about it, I decided to make this journal to pass them what little I know, and I hope that this is helpful for someone. Are simple tips and a little obvious, but unknown for some people who just started in this world full of possibilities. I only ask, first of all, for you dont give up. The difficulties were made ​​to be overcome. This is the central theme of the doubt of the people. I usually say that the choice of a specific brush, personalized and with a thousand possibilities of use, is more important when your desire is to do a painting of landscapes or complex paintings in which you want a result more "personal" and stylized. Most of my paintings, I'd say 95% of them were made with the standard brushes of Photoshop, except for one or two brushes of skin texture. You can do magic with a hard brush + one tablet, just learn to use and control the pen pressure to adapt it to the result you want to obtain. The best brush for me may not be the best brush for you. This is completely relative, and you will only find out which of these brushes makes you more comfortable to work when going to test them on their own and not rely solely on the opinion or recommendation of the people. 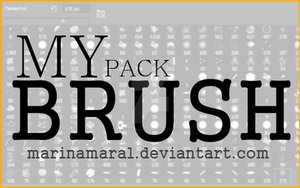 I have millions of packs of brushes of many different artists, and in the end, when I realize I've only used the standard brushes because I feel comfortable with them. This is how it works. I never had the patience to read a book of color theory. All my knowledge of colors is based on my observation. When I'm painting a picture I look beyond seeing it as a whole. I want to see the details. I like to see the colors that prevail, I like to see how a certain color behaves in the light and how it behaves in the shade... I think that all theoretical knowledge is valid when you understand it, but there are other possibilities for learning that will assist you in the same way. Take some pictures of reference and study it. Try to see the behavior of colors and hues, and using the color HUE of Photoshop, strive to achieve the same tones without using the color picker. It is very important that you develop your sense of color perception and dont need to make use of the technologies of Photoshop. Dont hold on to what the digital offers you. This is a tip I could give in all of the topics in this post. Reference photos are the key for develop your knowledge. I would be nothing without them. Search for reference photos of different kinds of women, men, children, elderly, cold, rain, sun, with studio lights, with natural lights, at dawn, at sunset, on the beach, in the forest, in mountains, at different times of the day, etc., and try to reproduce them. Try to see beyond what is exposed. Over time you will notice a significant improvement in their work. You will learn how the shadow behaves in a particular region from a specific focus light, what is the most appropriate tone to paint a particular scenario, what is the saturation of a color when it is exposed to the sun and when it is exposed to the moon, and know how it all works together. The internet is there at your disposal, look these pictures and study tirelessly. And of course, there are many excellent books available to them as well. Do some research, find the pdfs or buy books. Knowledge is never enough! I would tell you not to use the smudge tool. The result is much more beautiful when you learn to mix colors with brushes. * Reference photos, reference photos, reference photos, reference photos. Let your brain crazy with it. Fall in love with them and make a habit of studying them. * Redo the reference photos, and do it again without letting her sight. Test what you learned from your study. * Forget the packs with 250 different brushes!!! Learn to use the basic first and find the most comfortable for your work. With time you will know to choose a different brush for the composition of your painting. * There livestreams online 24 hours a day and many Youtube videos. Watch at least 20 minutes if you like. This was one of the habits that most helped me to evolve my knowledge. * Be inspired by other artists, and dont despair to find your own style. That comes with time! * Talk with other artists, exchange ideas and knowledge. You'll see that things are productive if they are taken in this way. * Dont be disappointed and dont give up when a result is not as you expected it to be. Get over yourself!!!! Pinterest, Deviantart, Flickr, Google Images, Facebook, Tumblr. I hope this is helpful. Please feel free to take your questions. I am here to serve them. One step ahead and you are no longer in the same place. You're an inspiration. How you transformed your techniques in just 3 years! Amazing! I am in that very period, frustrated with how bad I am. I gave up drawing years ago, and now I got back to it. I used to be very good so I am regretting why I never learnt along the way. I am keen on learning and this helps ALOT thank you! Muito bom mesmo ! Parabéns ! Obs: Vc sendo Brasileira não seria bom por uma link em pt-br não ? Pois muitos não sabem ler inglês ainda. Show ! Muito bom ! Muito obrigada pelas dicas, Marina!!! 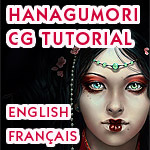 This is a fantastic resource, thank you so much! 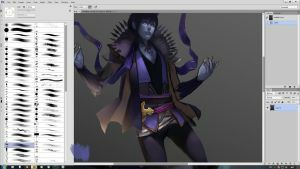 I'm just getting into digital painting myself, and I find this incredibly helpful! You obviously love to create, you do it often and now the time has come when you realize that this is no fling, this is something you would want to do for the whole life. You can learn a lot about techniques from numerous sources, you can find the right audience on the internet but there is one thing nobody can help you with but yourself - how to gain a specific style of your own? What is a personal painting style? How can one develop it? - Developing your style takes time, time and time once again. Don't have the time? No style for you! 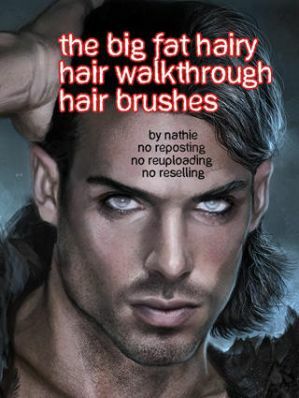 To start off with you may want to download some Hair Brushes - these are not necessarily dedicated to to just hair, but are packs with a few useful brushes. FYI My longest post on PC ever. Sorry in advance - OP I hope there's something useful in this for you. I'm back in your thread and giving you my morning before breakfast, is my way of saying ' I care '. Usually between 1 - 5 NEW students, per day come to me for random pieces of advice. Some from here @ PC , some from Deviant Art - Mostly from Deviant art. It's always the same questions maybe worded slightly differently and I do my best to answer every single time, every single message. Sometimes I get behind and have to catch up at the end of the week but I do my best. As well as those, I did 2 10+ question interviews last week, on my time, for students who were still in school. For school essays, papers, projects etc that contain the same questions they always do. What a letdown. No worse answer could be provided. Even if it didn’t make sense, anything would have been better. Digital painting tips for beginners.I'm not the best person to give advice about art, once I do not consider myself an artist (yes, it's true lol). But I've always been very curious and interested with the theme "digital painting", and I spent (and still spend) hours and hours watching videos 2 hours long on Youtube lol livestreams, etc.. I think I'm the only person who has the patience for it, hahahaha, but it was what helped me to evolve and learn all the techniques I know now to perform my work. I asked the help of many artists that I admire, and some even helped me, but most of them do not care how much you want to learn. Thinking about it, I decided to make this journal to pass them what little I know, and I hope that this is helpful for someone. Are simple tips and a little obvious, but unknown for some people who just started in this world full of possibilities. I only ask, first of all, for you dont give up. The difficulties were made ​​to be overcome.